Call us at (269) 685-9891 for special promotions. Enjoy the timeless design of our freshly decorated rooms providing you with the comforts of home. Deluxe rooms offer built-in hospitality center with microwave and refrigerator, 37" and 42" high definition LCD flat screen televisions with digital cable programming, over sized chairs, and writing desk with ergonomic chair. Deluxe King rooms offer seating area with sofa sleeper and walk-in glass shower with double bowl vanity, spa-inspired bath amenities and customized baskets are available for additional charge. Your comfort is our priority. Let us know how to make your stays with us more comfortable and help us more personally serve you. Inquire at the front desk about our "in touch loyalty program"
Complimentary coffee and tea are available in every guest room or enjoy a cup in the lobby as you indulge in the all-included hot breakfast and get caught up on the latest news with complimentary editions of USA Today. Guest rooms are serviced daily. To request additional service of a preferred service time, please contact the front desk. Cribs, rollaway beds, sewing kits, additional pillows and blankets are available upon request. The Signature Guest Rooms at the Plainwell Comfort Inn are distinguished by thoughtful design and comfortable accommodations that bring you the comforts of home. 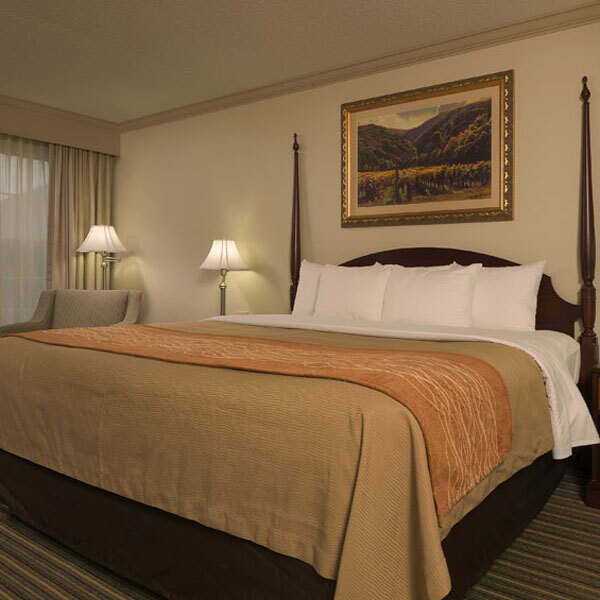 Choose from one king bed or two queen beds and surf the internet via high-speed wireless or relax while watching high-definition channels on a 37” flat panel television with USB port accessibility. Additional amenities below.